Euromax Resources (OTCQX: EOXFF; TSX-V: EOX) has completed an updated compliant resource estimate at Ilovitza to inlcude approximately 7,400 metres of drilling during 2010 and 2011. The updated resource estimate consists of sulphide and mixed resources, which is comprised of gold, copper and molybdenum, and oxide gold resources. 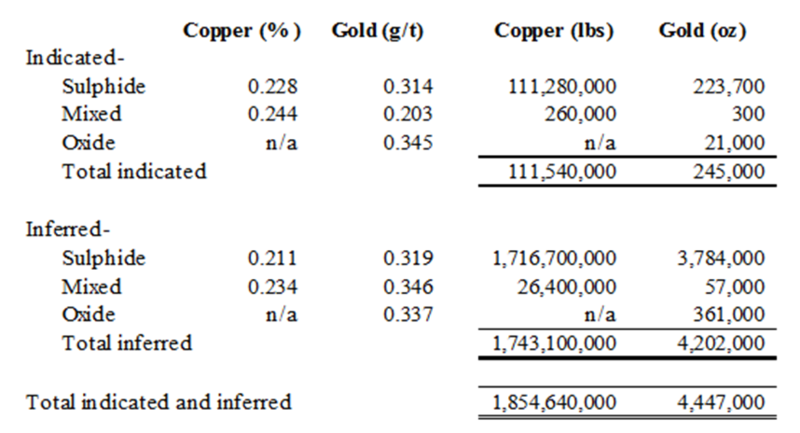 The table below summarizes the updated 43-101 compliant resource estimate at Ilovitza. Ilovitza now has an indicated resource of 0.2 million gold ounces and 111.5 million pounds of copper and an inferred resource of 4.4 million gold ounces and 1.7 million pounds of copper. In the aggregate on a gold equivalent basis, Ilovitza’s combined indicated and inferred resource is approximately 8.2 million gold equivalent ounces. Advanced Explorations Inc. (TSX-V: AXI; OTC: ADEXF) announced that it has entered into an agreement with the Government of Nunavut to advance research on alternative energy sources for use in northern Canada. The Company continues to study energy sources for use at its Roche Bay and Tuktu iron ore projects located on the east coast of the Melville Peninsula, in Nunavut, Canada. The Company believes the application of alternative energy sources can supply power and reduce its operating costs for the future mine and allow potential production expansions. In the release, John Gingerich, President & CEO stated: “The implementation of a sustainable, reliable and cost-effective power source for Canada’s North is the key to unlocking its true value and to facilitate economic and social development at a broader scale. We are very pleased to work together with the Government of Nunavut in moving forward with this vision. Our team has successfully worked on implementing a plan for an alternative power solution, and we believe that the potential savings in capital and operating cost or our mining projects will play a key part on our way to becoming a cost-competitive producer in the iron ore space”. Work on an initial NI 43-101 – compliant mineral resource estimate on the Big Bend and East Dyke gold zones of the Kibi Project’s Zone 2 has commenced by SEMS Exploration Services Ltd of Accra, Ghana. Lynden Energy (OTC Other: LVLEF; TSX-V: LVL) produced more than 500 barrels of oil equivalent per day, net to Lynden, from its 30 (12.86 net) Wolfberry Project wells during the ten day period ended March 31, 2012. The highest daily production during the period was 595 barrels of oil equivalent. The Company is continuing with its aggressive Wolfberry Project development plan which calls for the drilling of 31 gross (12.97 net) Wolfberry wells in calendar 2012, of which 4 gross (1.75 net) wells have now been drilled, completed and tied-in to production. On the Company’s Mitchell Ranch Project, two new wells have been scheduled for drilling in the area of the Spade #17-1 in June / July with the objective of developing the Wolfcamp zone that is producing in the Spade #17-1. This zone is at a depth of approximately 5,000 feet. You are currently browsing the BabyBullTwits blog archives for April, 2012.